The day hasn't begun well for me, it's wet and cold and I'm not prepared for it adequately. 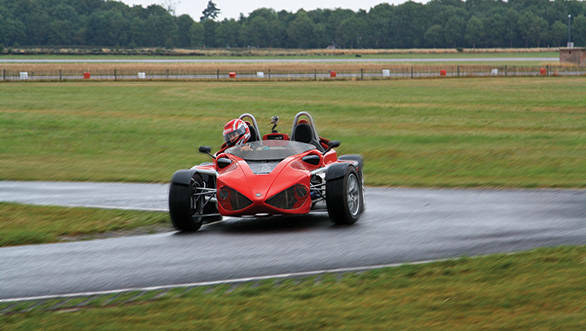 Both conditions are bad to drive a car that looks as track focused as the Deronda Type F does. The wet surface means less traction and the cold will not allow the tyres to heat up sufficiently which will only make things even more difficult. 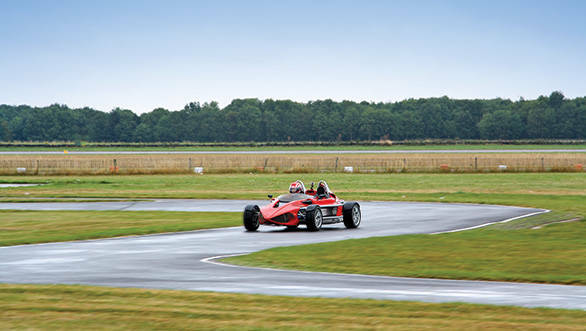 True enough, on my first lap out then I bin it, whacking the plastic Armco on a corner of the Bruntingthorpe airfield's makeshift circuit hard enough to scratch the fibre glass panels on the nose cone. The throttle's also stuck, and it puts a pause on my drive until things can be sorted out which eats into the better part of the day since one of the fasteners on the engine covers refuses to come off. Time then to delve into Deronda's legacy and history. 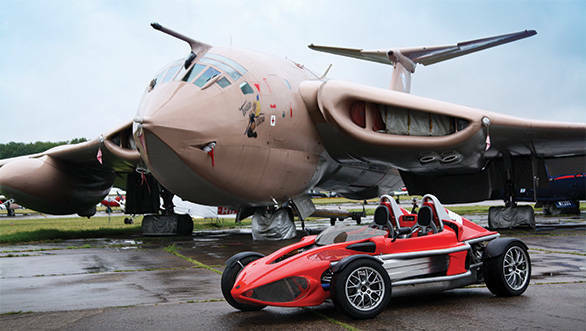 Deronda is a small British kit car manufacturer that makes just one car, the Deronda Type F. The company began on the whim of one automobile enthusiast, Andy Round, an airline executive who was looking for a fun to drive car both on track and road that met his specifications. There weren't any that were satisfactory so he went and designed his own car and got Racing Designs Ltd and Fabrication Techniques a sister concern to design and build the car for him. 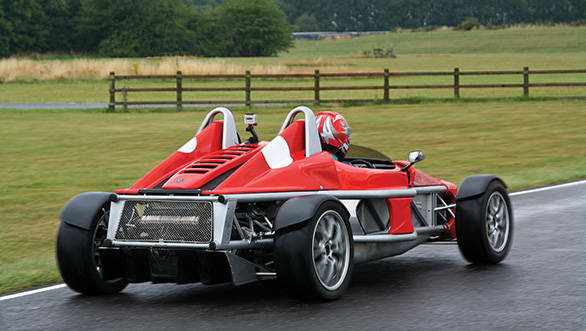 That was how Deronda was born and the first car called the F400 was a prototype that was as initial testers claimed a surprisingly good alternative to the Ariel Atom or a Caterham. Being a prototype the car couldn't be driven on the road and by the time the car got road worthy it was designated the Type F. Deronda had begun creating waves, small ones but definitely ones that would rock your boat hard enough. But lets get back to me standing by the side of the track feeling like an absolute tool for binning it on my first lap out. In between thoughts of whether it was me or the car that did it to itself, I start wondering if this car which is soon coming to our shores has any future here looking the way it does. I mean its tough enough to get Indians to accept cars that don't look conventional, seat four people and with all the creature comforts needed for a hot, cold or wet day. On our subcontinent we want a car that makes a style statement, looks richer often gaudier and even sounds louder than what our neighbour has and we want it to climb Everest on a single tank of fuel. The Deronda Type F is unfortunately none of that. It looks like something Jeff Goldblum would happily mate with in the Fly. The sharp nose cone with its bug-like massive intake ports shielded by a honeycomb wire mesh looks positively housefly-ish. That look is entirely a mechanical derivative needed to feed tonnes of air to the radiator that sits right inside the nose cone. That bit of engineering is something anyone in colder climes will appreciate tremendously because it channels a lot of hot air towards the cabin keeping the occupants warm. It won't work in India but there's scope for improvement and two smaller radiators will be placed on either side of the car just ahead of the rear wheels. From a more side profile you can however clearly see a resemblance to a shark's nose giving it a more aggressive stance. While it definitely isn't good looking it certainly is a head turner with a dynamic presence. This particular car had body panels made of glass fibre but you could specify carbon fibre if that is what you seek, enhancing the aggression. In this two tone shade of red and black it does look a lot meeker than the pictures we saw of it in full carbon fibre trim. The 2-seater tub looks a bit odd with the incredibly tall roll over hoops behind the seats, like it was built specifically for the Dutch, some of the tallest people on the planet. But I cant ignore the fact that its a spacious cabin and the guys at Deronda pride themselves on the design of this tub which allows your elbows to stay inside the tub and not hanging on the outside of the body panels. What you do notice and what any enthusiast would like is the exposed steel tubular chassis that looks inspired wholly by naked muscle bikes. The way that frame stretches itself around the car isn't for visual pleasure but to enhance impact resistance from the side or front. In many ways the Type F is the closest I think you could come to experiencing the sensations of a motorcycle without being inside a cage. You'd also like the exposed suspension arms made of unequal length double wishbones and subtly visible pushrod dampers lurking longitudinally under the hood. There's a barely a few inches of ground clearance and you sit so incredibly close to the ground, you'd see the under chassis of a SUV if parked next to one. Driving the Derondas Type F dictates a proper dress code, you need to don a raincoat and helmet or in the monsoons you'd be covered in filth and in the summer bugs of all sorts. Now the engine sits right behind the bulkhead quite close to the middle of the car though the weight is biased towards the rear. 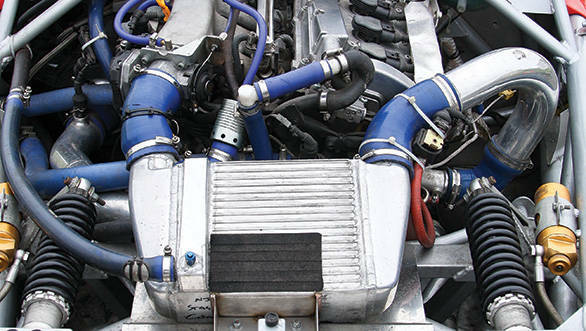 The engine is sourced from Audi (the A3) and there's enough power on tap for unbridled performance. Its a 1.8-litre, 4-cylinder, 5-valve per cylinder turbocharged petrol engine and its good for around 250 horsepower driving the rear wheels. That power can be raised to 300 horses from the same engine while there is also enough space under the covers to place either a V6 or a V8. Though Deronda claims getting the power of a V8 under there would be a bit ridiculous in a car that weighs just around 660 kilos, you'd be doing nothing else but burning out the tyres doing doughnuts while trying to rein in that power. That excessive power and going round in circles incidentally is a very American thing, its why the cars sold stateside comes with a massive 500 plus horsepower engine! By early the same evening the sticky throttle issue was sorted and Alistair Courtney who's more grease monkey than managing director of Deronda Cars Ltd hesitantly (as if I'd prang it again) asked me if I wanted to give it another try. The sun literally barged its way through the clouds and shone down burning off all the dampness to a crisp evening. Would I give it another try, do men not stare at skin tight denim clad women? Stupid question! 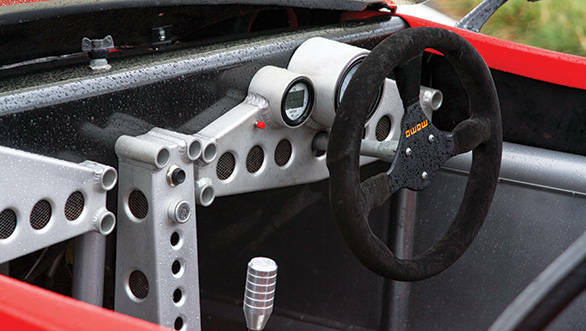 In seconds I was back into the racing seat and buckling up the four point harness. Flip the ignition switch up, there's no key fob like in a conventional car, thumb the starter and the engine barks to life in a short but gripping staccato before settling into a lazy hum. It's a bit odd to hear such little noise but then you have to remember that the Type F is also road legal and that means it can't exceed legislated decibel levels. At a steady low rpm clip you could comfortably drive this car from India Gate to Gurgaon and creep past every traffic cop silently. But strangely enough even at full clip with the rpm on the digital tacho / speedo console reading above 6000rpm the only noise I could hear was the wind filling the inside of my helmet. With just the 250 horses the Type F disappears into the horizon faster than a up to 80 per cent off Victoria's Secret sale. 100kmph takes just 3.2 seconds and a slight tweak makes it even quicker though no one has tested that so far. Top speed is rated at a 143mph or 230kmph but on one glorious run with the sun shining brightly for a change and the track completely dry I saw the digits read 149mph (nearly 240kmph) and it just felt like there was more to come if not for the airstrip rapidly running out of tarmac. The acceleration is linear there's no low rpm lag because its a petrol engine but when the crank spins quicker than 1700rpm the boost from the turbo pierces a gaping hole in the space just ahead of the car. Its a vicious sensation and with rear wheel drive one that demands exacting control of just how much throttle is being fed to the engine. One wrong move in a corner and you too would easily end up on a high speed shunt like I did a second time, spinning off a taxiway at over 200kmph onto the grass. That however was testimony to how well the Type F is setup, the suspension never buckled and we never rolled over saving the roll over hoops and our helmets some work. The Type F handles like cream sliding down your throat along with a big sip of deliciously cold lassi. Its sweet, has tangy overtones and completely blows your mind. Don't bother about ride quality, the Type F is far from your A8 in that aspect, but put both on a track and the Type F would run rings around the flagship Audi. There's literally no understeer and the Type F will hold to its line like two ends of velcro. But what makes the Type F truly utterly uplifting is the utter and total lack of any electronic aids. There is no traction control, no ESP, no ABS, just you the car and ten Hail Mary's. The Type F fortunately responds like it was born to do this, the rear wheels step out lightly and then the front tyres grip as the suspension expands on one side and compresses on the other. In that instant your right eyeball is either pushing the left one out of your ears or the other way around. There's grip and more grip and you realize that the grass on the edges of the track will stay right there, you wont mow it down as you continue to have a blast, relentlessly unmercifully thrashing the Type F around a circuit again and again and again. Its also quite amazing to be able to see where your tyres are going and being able to place the ones at the front exactly where you want them to be. The non assisted rack and pinion steering is pure but precise and gives the right amount of weight every scribe yearns to have in their everyday hatchbacks. The Deronda Type F eventually comes down to just this, a tub, an engine and two seats. Its the perfect driving machine, an immense tool on the track and what every enthusiast craves for at the end of the day. It's coming to India soon and in all probability the ESTD (short for Established, a division of Interglobe Aviation) will build the cars here, this is a kit car after all. If it comes by the CBU route it's not going to be a cheap affair, but that is why the efforts to build the car here which will also mean adequate service support. We expect the pricing to be around 20-25 lakh rupees, and given the new parking space at the Buddh International Circuit and the number of HNIs based in Delhi looking for newer thrills the car should do relatively well. A new playground definitely deserves a new toy!